I’d been dreaming of, and scoping out, drum carders for a while now. The thing is, they are a little spendy. So I kept a close eye on Craigslist. And after a time, I thought that maybe the universe was telling me that I wasn’t supposed to have one. Then, out of nowhere, comes Clem. He still needs a drive belt. But I’ve got that ordered from Clemes and Clemes already. For right now, he’s making do with a double thickness of jute twine. And here is my first batt. 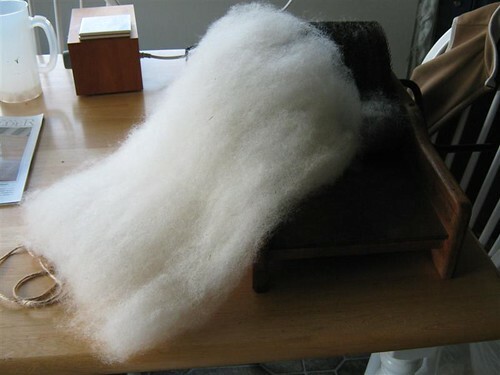 East Friesian wool from Quiet Water Farm. Fluffy and beautiful. I luv the beautiful wood on those Clemes carders. Have fun ! I love the oak, too. He’s just as simple, old fashioned, rugged guy. And he’s doing a great job! I am totally hooked. 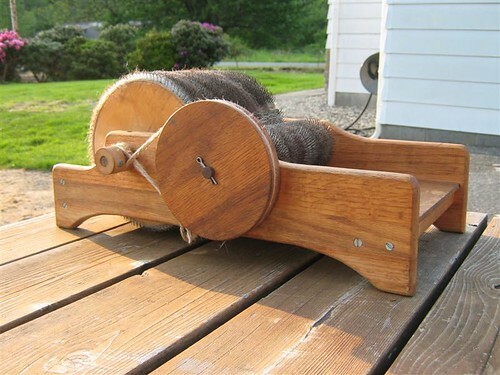 I’m delighted that you found a drum carder! 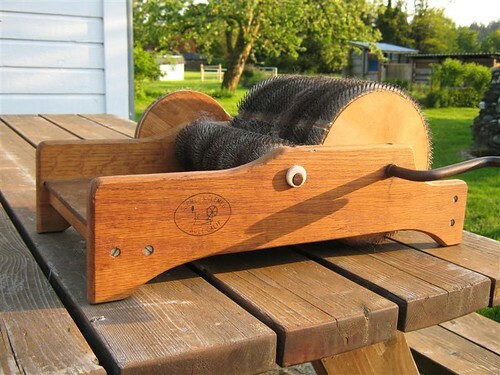 Perhaps we could barter a little fleece for some carder time? I have 5 raw fleeces in my garage. Can we talk? I got a great deal on one of those, too. Have used it very little so far because my fiber fun has to take a seat at the back of the bus while I’m homeschooling, etc. But I will have more time for fiber someday, and my Clemes and Clemes will be no worse for the waiting!